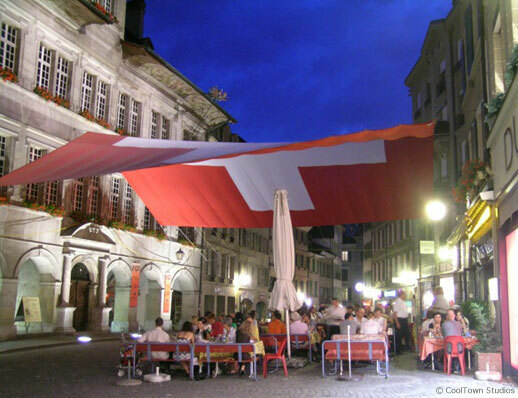 In the historic city center of Lausanne, Switzerland, an hour away from Geneva, the Place de la Palud seems to represent the heart of the town. With a ‘Fountain of Justice’ dating to 1557 and home to the present Town Hall, it’s literally been a center for centuries. On Wednesday and Saturday mornings, a public market is held on its surrounding pedestrian streets, and there are a lot of pedestrian only streets, all filled during the day. In fact, the area represents the main shopping district for the city of 129,000. While many of the stores are national/international chains, there still is a predominance of local, independent restaurants with outdoor dining, as you can see above. The outdoor dining scene, far and away, is what adds vibrancy and authenticity to the pedestrian-only square. During the day the streets are full of shoppers, though during the evenings the activity is a fraction of that, primarily because of the majority of chain stores versus cafes and restaurants. However, the economy and wages are Switzerland are designed where its staff earns a minimum four times higher than those of most cities, so dining out is extremely costly, and thus noticeably infrequent. Hence, the lack of street life at night throughout the entire city. Still, if other cities had Lausanne’s urban fabric, the squares and streets would be filled day and night, no question.